Follow in the footsteps of ancient craftsmen to open a window on the past. My name is Neil Burridge, welcome to my Web site. 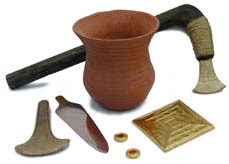 I am a specialist in reproducing bronze age artifacts using authentic materials and methods. Throughout the year I run a series of practical workshops at different venues, covering many aspects of prehistoric materials and the technology to work them. They are very hands on, and are designed for people with no previous experience. They offer you the chance to follow in the footsteps of ancient craftsmen and learn some of their skills to open a window onto the past. DEEP EARTH A recent BBC documentary series I was involved in. Text and images on this site © Neil Burridge 2001- 2012 unless otherwise stated.